In the western highlands of Guatemala, hunger is a daily concern among Indigenous Maya-Mam people. Climate change and deforestation have led to low crop yields. Discrimination and poverty make it difficult for women and men to start farms or buy food for their families. 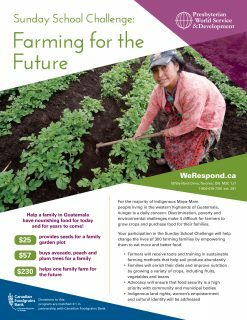 PWS&D is responding with Canadian Foodgrains Bank and local partner AMMID to help 300 farmers learn new organic farming practices that will increase crop yields, enrich diets and improve their families’ nutrition. Advocacy with municipal bodies will ensure that food security is a priority. Indigenous land rights and women’s empowerment will also be addressed. By taking the Sunday School Challenge, your gifts will help families in Guatemala have nourishing food for today and for the future! 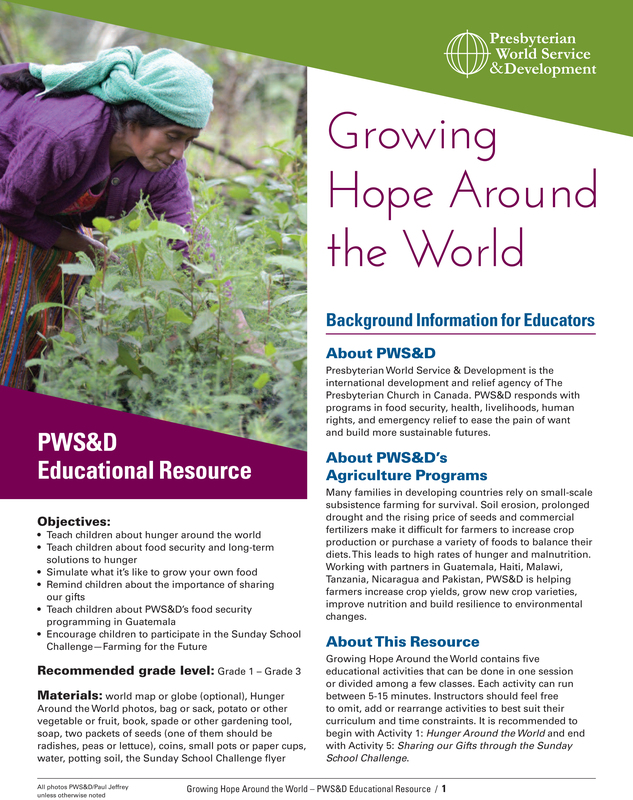 To accompany the Sunday School Challenge, PWS&D has a new educational resource! 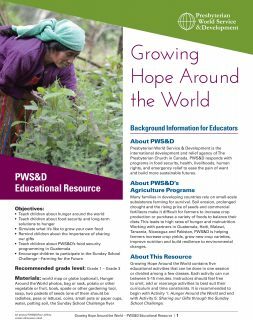 Five engaging activities will help teach children (Grades 1-3) about hunger in other parts of the world and the ways PWS&D works to restore food security in vulnerable communities. It will also remind youth about the importance of sharing our gifts with those in need. This program is supported in partnership with Canadian Foodgrains Bank. PWS&D is a member of Canadian Foodgrains Bank, a partnership of 15 churches and church agencies working together to end global hunger. Donations to this project are matched 3:1 through PWS&D’s partnership with CFGB.